These transducers dramatically increase sensitivity to small defects and are particularly useful for accurate measurement of thin wall materials. 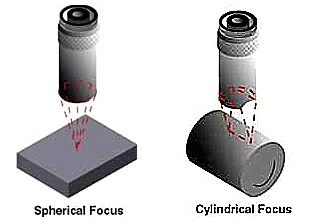 When used in high speed surface testing, spherically focused transducers minimize noise to signal ratio and increase power significantly, therefore exposing very small defects. These transducers are extensively used in the testing of pipes, tubing, bar stock and other comparable cylindrical objects. One of our correctly configured transducers enables you to minimize unwanted beam spread, improve scan index and can greatly increase testing speed and sensitivity. 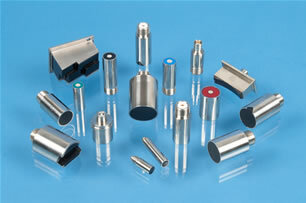 Every variety of focusing is available on all Camasonics immersion transducers. Please specify the focal length required, taking into account the water path and the material to be tested. When a focused transducer is requested a description of your requirements is beneficial to allow us to ascertain the most effective configuration in relation to your defect standard e.g. focal length, water path, frequency, thickness/size of the material etc. One of our consultants will be happy to help you if you are at all unsure. There is more information on focusing, see the Technical Details page.